Here's my latest set of dyno's. The one dated April 3, 2006 was done after I had my coils replaced and I installed a set of Racing Beat plug wires. You can see some improvement on this chart from my previous one of where I had plugs replaced. 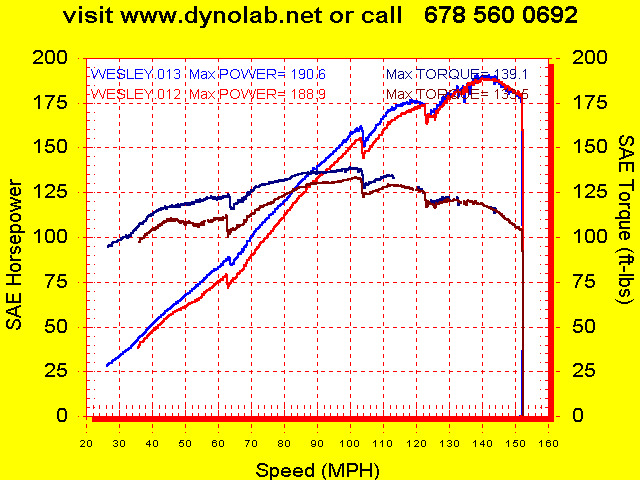 The other two dyno's are from April 17, 2006. These are dyno's taken after I installed the Agency Power underdrive crank pulley. 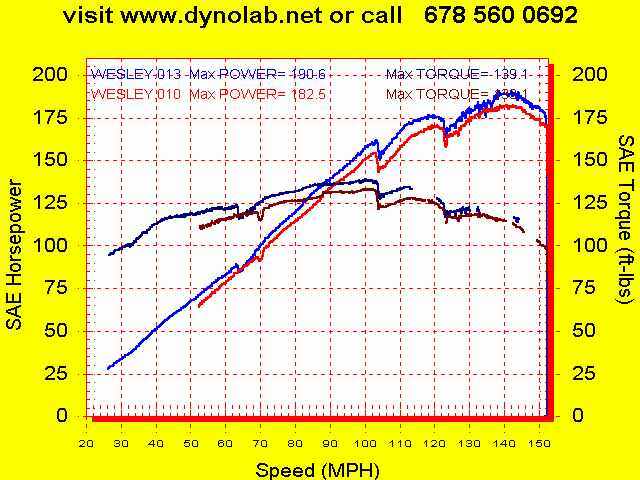 One of these dyno charts is what they are using for their marketing (with my permission) incase you noticed a similarity from the one on their webpage. Definately see and feel some power down low. Minor peak power gains but the torque is definately improved. The pulley got me into the 190hp range. I may get some more hp after I install an exhaust since I am still running stock. Hey there guys! 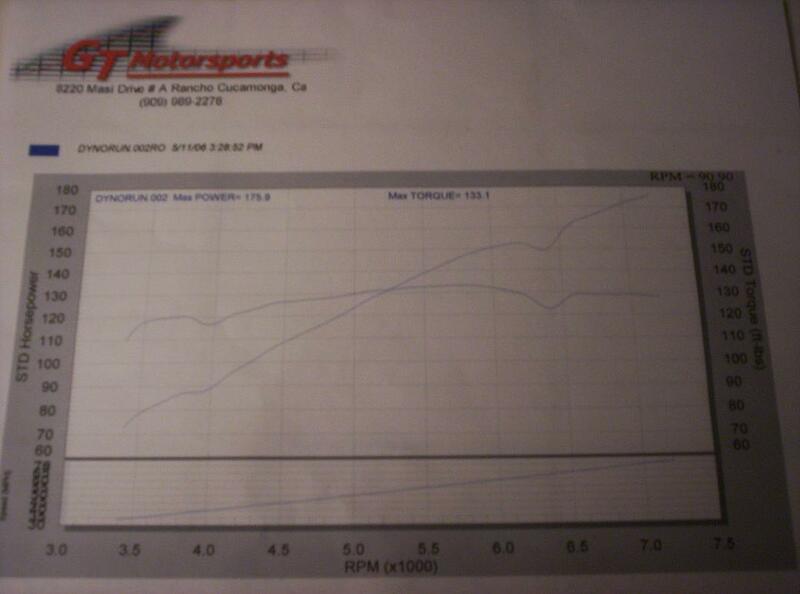 Thread bump with an actual dyno picture attached! 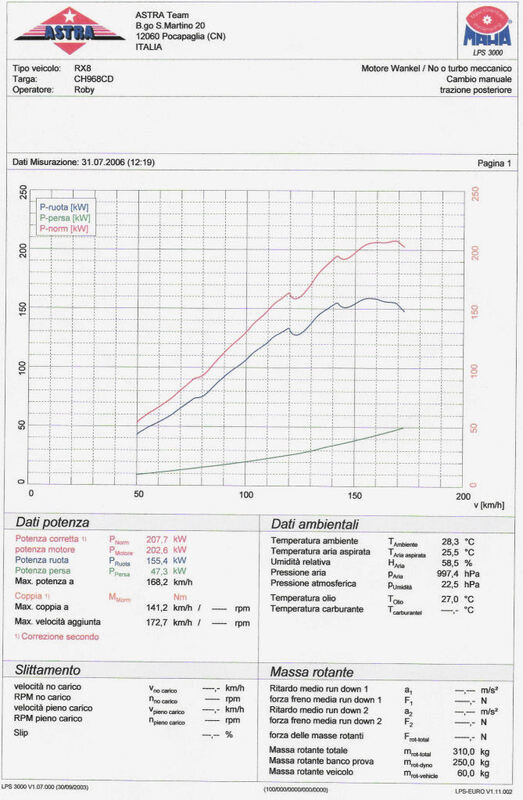 I am preparing my car for the upcoming meet and the tuning shop and myself decided on running a dyno before and after to compare the results at the same dyno shop. Here is a graph of my car before the mods. They have already installed all of the products that I purchased and will be running another dyno run either tomorrow or Wednesday. I'll be sure to post up those results as well once I get them. SR Motorsports flywheel, Racing beat Revi/Air Duct, RP Bonez high flow cat, Turbo XS exhaust MS Front bumper/Rear bumper.... no comments about these please..
(The car sounds so damn wicked with the RP Supercat/Turbo XS exhaust)!!!! Last edited by davefzr; 05-15-2006 at 11:39 PM. looks good, i am guessing it is a mustang dyno!! Hey there guys.. They dyno'd my car after the installation of the mods and the final whp number is 185. Not too bad, but the official number of my car comes once I get it tuned by Scott this weekend! Thankx to everyone that recommended the resonator to me!! I hope it works as well as it has for you!! Thats for sure!! do you have an explain ?? bump is perfectly normal and your engine seems to be operating very well. New coils installed today. No time to dyno this weekend or next but hopefully I will be able to show a change over my last run and show the difference new coils make. That will be the only change since my last run. Last edited by SilverEIGHT; 05-27-2006 at 08:21 PM. 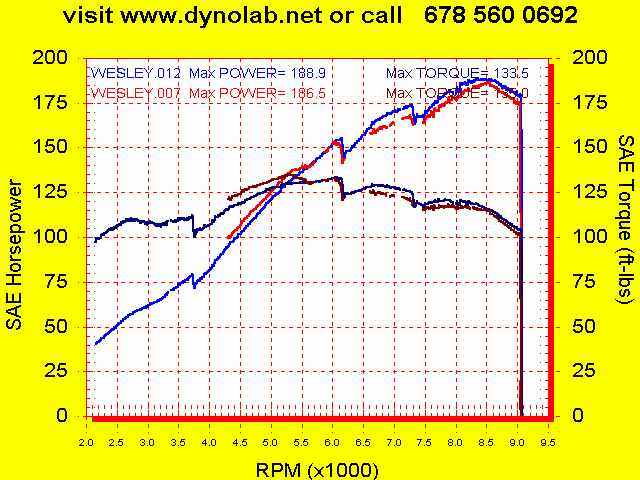 Does your car feel any stronger to warrant another dyno like mine did? let me know when you plan on going and I will try and stop buy for support, then we can get some Williams Bro's BBQ!! Yes it does. Not shure how much is imagined but I definately feel more on the top end which is what I expected. Just back from Dynolab in Marietta. I'm not sure what's going on with the chart above 7K RPM but it did the break up thing 3 times. Each time we moved the contact locations. I then cleared the memory and tried it again for this 4th run of the day which was the best but this breakdown in the signal is really bothering me. Two other 8's ran and did not have this problem. My change before this run is new coils only. No modifications. There is a modist gain over the last run. Last edited by SilverEIGHT; 06-17-2006 at 04:14 PM. still interferance with all the squiggles but ---you got to 190 and 138 which aint bad dude! what did the others do? Seem like we Ga boys have some strong eights! Charlie was over 200. Can't remember specifically. I took my car to Mazcare and Charlie pulled the plugs. Found a mixed set of plugs. New type leeding and old type trailing. My car flooded around 17,000 mi. and the dealer only put in new leeding ones. The trailing have been in for 26,000 miles. He changed my plugs out for a brand new set and the car is running better now. He seems to think that could have made a difference on the dyno. I really don't feel like paying $50 again just to see if the plugs were the problem. Wish there was such a thing as a free dyno! Maybe, maybe not. Mine was done the same day with out any of noisy lines. I'm not convinced that it's not the dyno but plugs and coil issues have shown up like this before. could it be your little HKS ignition gizmo. Sorry, I cant remember what it was called. Your car has always had smooth outputs, without that signal breakup, even before the addition of the HKS unit. But you also have very few miles too. I've done some searching but i can't seem to find a list of your mods, if any. Nice dyno BTW. Roger that. I don't know that it's an rx8 issue but maybe a dynojet ignition pickup issue. i have not seen your graph but if it drops out at hi rpm I gotta wonder if it's to many events to capture. No definitive answer, just guessing. Which is pretty much exactly what Team Rx8 had said. I am removing my head from my *** now! Exhaust with racing kat, DSC and PCM reflash, racing intake duct, new pcm wiring loom, 41/9 rear LSD @ 16Kg, engine light tuning by Astra, direct steering rack, running with Shell V-Power 100 octane fuel. Standard car had about 200hp ECE95 (SAE equivalent) @ the crank.....as usual here in Europe. yeah lets stick with the actual measure power and not use the "run down" calculated flywheel power. that will only cause confusion and arguements. so alex you started with about 180 at the wheels and now have just ove r208 at the wheels . thats great. what temps are you seeing in the exhaust- could the regular CAT stand the heat from that tune? is anyone running a Supercharger on the street with one of Astra's tunes?